Duchin Entertainment: For more than three decades, Peter Duchin and Duchin Entertainment have extended the music legend which his famous society band leader father, Eddy Duchin, began in the thirties. Peter is the premier band leader having formed one of the most versatile, prestigious, and sought after bands of the modern era. Clients the world over have delighted to his music, his style and his persona. Duchin Entertainment: Traveling the globe from London to Paris, from Venice to Vancouver, from South Africa to Hong Kong, Peter and his orchestra have performed at some of the most exclusive celebrations ever held: presidential inaugural balls, weddings, private parties, charity benefits, political conventions, corporate functions to college concerts and proms. Duchin Entertainment: Peter and his various bands and orchestras play more than 400 engagements per year. A call to Peter Duchin Entertainment ensures that your event will be handled with the professionalism, personal commitment, expertise, and style the name "Duchin" represents. Duchin's background is a remarkable mixture of show-business and high society. His mother, Marjorie Oelrichs, was the daughter of a socially prominent Newport and New York family and a celebrated style-setter in the 1920's and 1930's. Tragically, Marjorie died of complications in childbirth shortly after Peter was born in 1937. Heartbroken, Eddy Duchin asked his good friends, Averell and Marie Harriman, to care for his son Peter. Peter was raised by the wealthy statesman and his wife while Eddy toured with his band. He later served with distinction as a Naval combat officer in World War II. The beautiful and tragic story of Peter's parents is wonderfully told in the 1956 movie, The Eddy Duchin Story, starring Tyrone Power and Kim Novak. As a youngster, Peter began playing music with his father. Later, he played in bands at Eaglebrook and Hotchkiss schools in New England. He continued to develop his love for music at Yale, where he received his BA in music and French Literature. He also attended the Sorbonne in Paris where he studied composition with the widow of the distinguished French composer, Arthur Honegger. During a two-year tour with the US Army in Panama, he played in the US Army Band and helped form a jazz orchestra that performed to great acclaim in Panama City, throughout Latin America and on The Ed Sullivan Show. 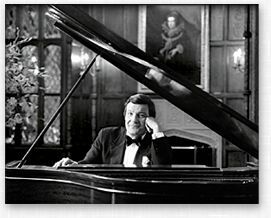 When Duchin returned to New York, he embarked on a highly successful studio career of over 26 recordings. In 1962 he opened with his band in The Maisonette, at the St. Regis Hotel, which quickly became the most successful supper club in town. In 1964 he took on the job as musical coordinator for President Lyndon Johnson's inauguration. After this prestigious event, he and his band went on the road for their first national tour. On his return he organized Peter Duchin Orchestras and Duchin Entertainment, which has provided top quality music and entertainment ever since Peter recently released his first book, "Ghost Of A Chance: A Memoir" through Random House publishers which is now available in paperback. "I was captivated by "Ghost Of A Chance" - it's a great read. And I'm delighted Peter is sharing his terrific reminiscences. He's at the top of his profession and has led a fascinating life. Peter is as good with words as he is with the ivories. His father, Eddy; myself; and Jackie Gleason were great pals. This book brings back memories of very special times." "A wonderful life, but Peter did not have it all. His book will surprise you. A must." "Peter Duchin's glamorous story is about absent fathers, surrogate mothers, and dwelling on the edges of money and power in a tuxedoed world." "Off the scales! A lively memoir that amuses and instructs about a society of privilege." "Peter Duchin's "Ghost Of A Chance" is engaging and entertaining, a jeroboam of vintage champagne that never loses its fizz." Duchin Entertainment feels that each client is unique and deserves unique personal service. If you have a club, restaurant, hotel or other venue in need of entertainment on a regular basis, Duchin Entertainment can provide whatever you need. We provide the talent, music, services, supervision, and follow-up; you just sit back and enjoy.